The Corgi Toys line was started by Mettoy Playcraft Ltd. in Great Britain. Mettoy was founded in 1933 by Philip Ullmann in Northampton, England, where he was later joined by Arthur Katz. Both decided to market a line of toy vehicles as competition with Dinky, a dominant player in the diecast market. Corgi Toys were introduced in the UK in July 1956 and were manufactured in Swansea, Wales for 27 years before ceasing production. I decided to add Corgi to the growing diecast database here at the site for several reasons: One, to expand the guide and provide collectors yet another resource for researching their dicast cars. Two, there are very few, if any, price guides for Corgi on the Internet. 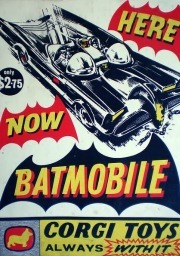 Three, the Corgi line was one of amazing quality and detail, with licenses to the likes of James Bond, Batman, Chitty Chitty Bang Bang, The Beatles, The Monkees, Green Hornet, Starsky & Hutch...and so much more. Remember, this was a leading line of diecast that competed with the likes of Dinky and Matchbox for diecast dominance in the U.K.! You couldn't put out a subpar product and expect to survive the competition during this early era of miniature cars. It was all about attention to detail, and Corgi Toys nailed it with their products. Trouble finding a car in the guide? Try the NCHWA.com search engine!